Originally posted: June 27, 2018 . Last modified: April 3, 2019 . Craving a blueberry cheesecake dessert? 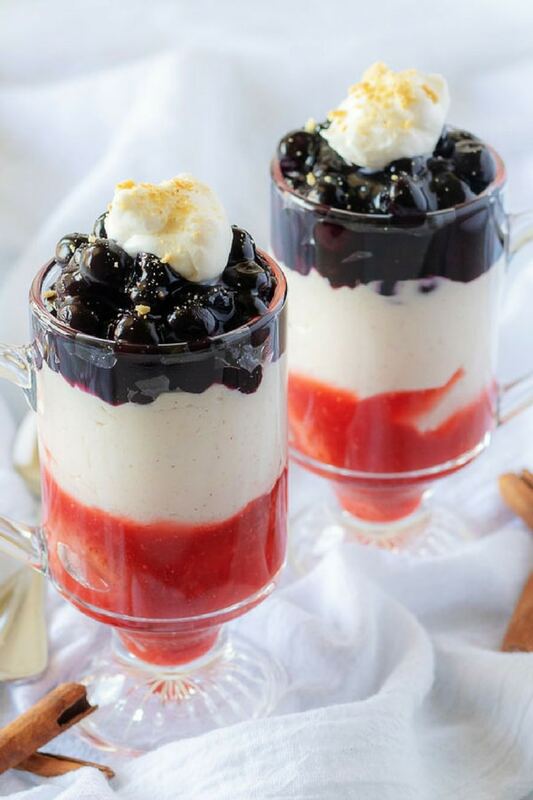 Our delicious parfaits feature toppings made of strawberries and blueberries, with a smooth cheesecake filling. 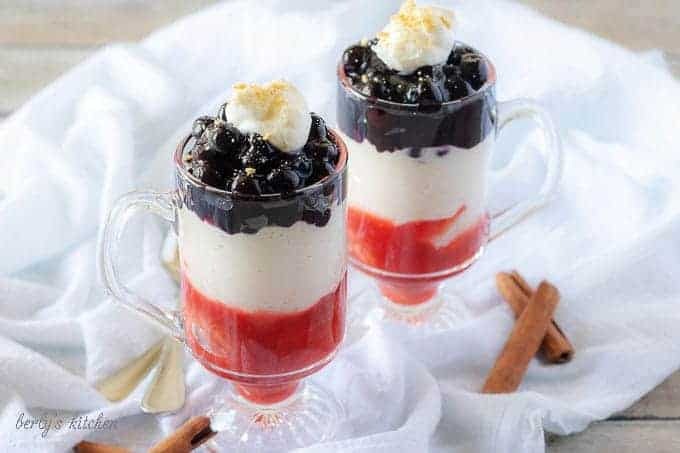 With the Fourth of July fast approaching, Kim and I wanted to share a cold Summer dessert that’s perfect for your holiday celebration. 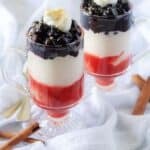 These rich and decadent parfaits feature two kinds of fruit toppings along with a sweet and creamy no-bake cheesecake filling. While there are a lot of steps, I will offer some shortcuts you can take to cut down on your time in the kitchen. Since this is a longer post, I’m going to go ahead get started. 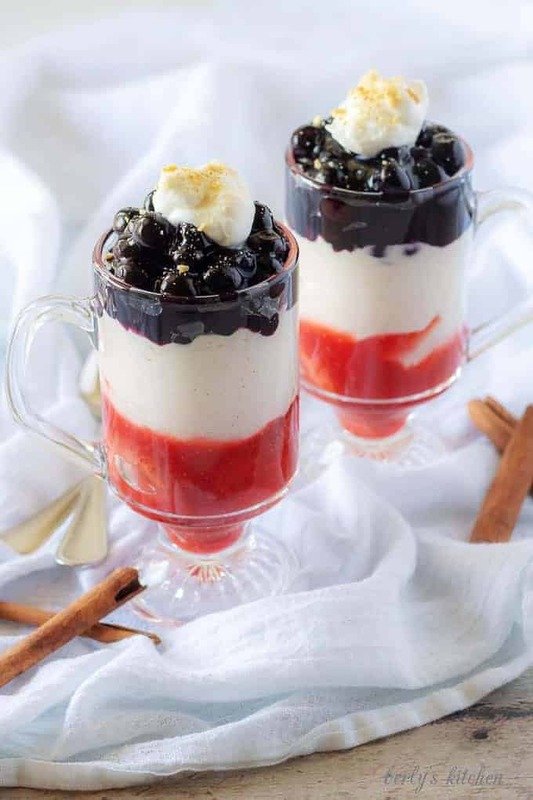 We’ve provided a few extra process shots to give you an idea on how the dessert should look as you go about preparing these strawberry blueberry cheesecake parfaits. Whenever I am working on a recipe that requires cream cheese, I like to pull it out the fridge first. That way, the cream cheese can soften while I prep all the other ingredients. Also, another kitchen habit that saves time is to grab all of your ingredients first before you start cooking. Look to our pictures as an example, we don’t just put the ingredients into bowls for the photos, we actually cook that way. First, in a medium saucepan combine the berries and sugar. Simply dump the blueberries into the pan and sprinkle the sugar over them. Then, make a slurry by mixing the cornstarch and water and pour it into the boiling blueberries. The reason I made a slurry is avoid having clumps of unmixed cornstarch floating in the topping. Last, continue cooking the mixture for 2-3 minutes or until the blueberry topping thickens. Set it in your fridge to cool while you make the cheesecake filling. 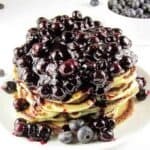 Now, you can avoid this process altogether if you use a canned blueberry topping. However, we prefer fresh berries to canned. The picture above should give you an idea on how the strawberry and blueberry toppings should look once cooked. First, in a stand mixer or mixing bowl with a hand mixer, combine the heavy cream and powdered sugar. The use of powdered sugar is simply based on preference, you can use granulated sugar if you like. Now, whip them together until the whipped cream forms stiff peaks. 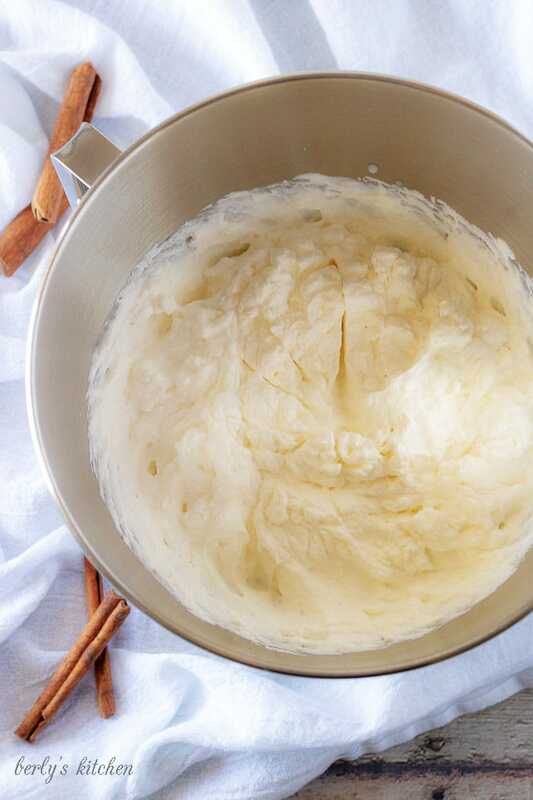 Keep in mind that the colder the cream is, the easier it is to make whipped cream. Also, just for the record, the bowl DOES NOT have to be cold to properly whip cream. Sure, it’s faster, but it’s not necessary. Set the whipped cream aside. Also, take note that using Cool Whip or some other whipped topping will save time. Next, in a stand mixer or mixing bowl with a hand mixer, combine the cream cheese, granulated sugar, vanilla extract, and cinnamon. I just removed the whipped cream from my stand mixer bowl, rinsed it out, and reused it for the whipped cream. It’s kind of pain, but worth the effort. Then, mix them together until well-blended and creamy. Typically, I use the medium setting for 3-5 minutes. 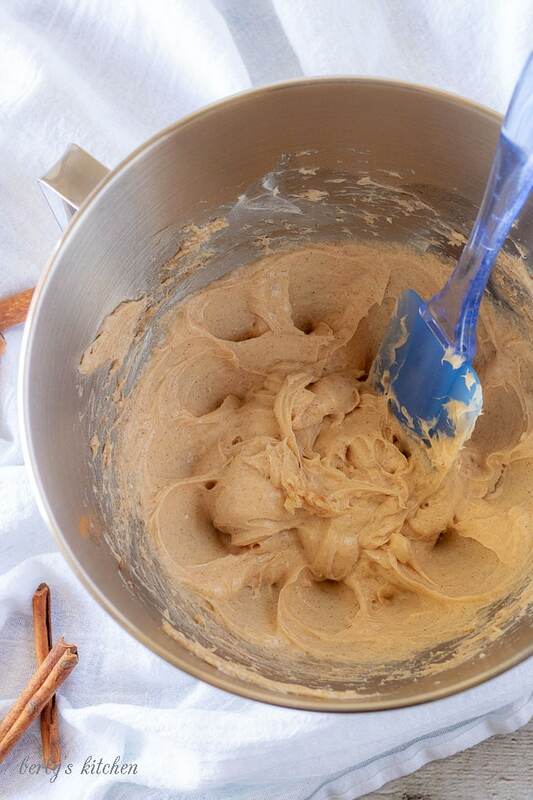 Additionally, you may have to stop the mixer to scrape the sides of the bowl just ensure all the ingredients are mixed. I wouldn’t recommend taste testing this part of the recipe. This mixture is heavily spiced and would not taste very good. It needs the whipped cream to tone down all those heavy flavors. Last, use the low speed on your mixer or a spatula and combine the cream cheese and the whipped cream to create the cheesecake filling. Many recipes recommend folding the cream cheese and whipped cream together. That’s fine too, I just prefer using mixer on a low speed setting. Set the filling in your fridge while you make the strawberry topping. Letting this chill in your fridge will help set up so it can hold all that tasty blueberry cheesecake topping. You will have extra cheesecake filling left over. It makes a wonderful no-bake cheesecake, so feel free to put into a prepared graham cracker crust and refrigerate it for at least 2-hours before serving the pie. First, in a medium saucepan combine the strawberries and sugar. As you can see making this step is just like making the blueberry cheesecake topping. Next, cover the pan and let it cook over medium heat for about 10-15 minutes. Similar scenario, cooking times will vary slightly based on how unthawed the strawberries are when you get started. Then, make a slurry by mixing the cornstarch and water. Now pour the slurry into the boiling strawberry topping. Last, continue cooking the mixture for 2-3 minutes or until the strawberry topping thickens. Set it in your fridge to cool for at least 30-minutes before assembling the parfaits. Once again, you can skip all this work if you use a canned strawberry pie filling. First, take an 8-ounce glass and fill 1/3 of the glass with strawberry topping. I know that may sound a little strange, so checkout the picture above and use it as a reference. If you want to avoid a messy looking dessert, then use a fork to put the individual strawberries into the glass. 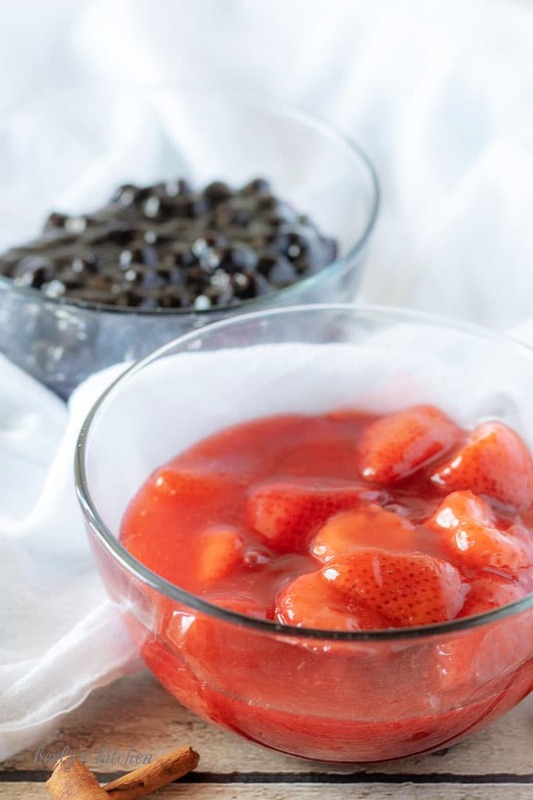 Now, use a small spoon to drizzle the sauce over the berries. Next, add enough cheesecake to fill another 1/3 of the glass. For this part, I filled a freezer bag with cheesecake filling and then piped everything into the glass. Kim then used a spoon to spread it out evenly. This is a lot work and we only did it that way to ensure the parfaits looked pretty for the photos. Now, top off those layers with blueberry cheesecake topping. That’s pretty much it as far as assembly goes. You can do what we did and top it with more whipped cream and crumbled graham crackers, but that’s totally optional. Last, serve the finished parfaits with garnishments of your choice. Looking for other awesome parfait ideas? Then checkout our Light and Fluffy Lemon Parfaits or our Delectable Dessert Parfaits! First, in a medium saucepan combine the berries and sugar. Next, cover the pan and let it cook over medium heat for about 10-15 minutes. Then, make a slurry by mixing the cornstarch and water and pour it into the boiling blueberries. Last, continue cooking the mixture for 2-3 minutes or until the blueberry topping thickens. Set it in your fridge to cool while you make the cheesecake filling. First, in a stand mixer or mixing bowl with a hand mixer, combine the heavy cream and powdered sugar. 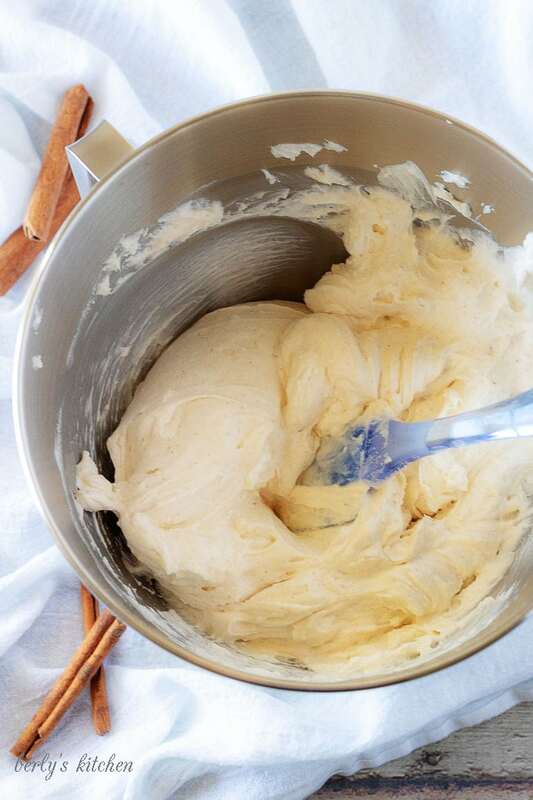 Now, whip them together until the whipped cream forms stiff peaks. Set the whipped cream aside. Next, in a stand mixer or mixing bowl with a hand mixer, combine the cream cheese, granulated sugar, vanilla extract, and cinnamon. Then, mix them together until well-blended and creamy. Last, use the low speed on your mixer or a spatula and combine the cream cheese mixture and the whipped cream to create the cheesecake filling. Set the filling in your fridge while you make the strawberry topping. First, take an 8-ounce glass and fill 1/3 of the glass with strawberry topping. Next, add enough cheesecake to fill 1/3 of the glass. Now, top those layers with blueberry cheesecake topping. The calories listed are an approximation based on the ingredients, are composed of four 8-ounce servings, and do not reflect the calories in the garnishments. Actual calories will vary. Parfait steps can be completed up to 24 hours in advance and stored in the fridge to be assembled into parfaits just before serving. What a wonderful way to celebrate berry season. Love the presentation of these tasty desserts. What a great way to end a meal during a BBQ party. These are so pretty! If someone made this for me and brought it out after dinner, I’d be so impressed! What a festive dessert! Perfect for the 4th of July. Mixing the strawberry and blueberry is a best of both worlds too! I just used the very last block of cream cheese we had in the house yesterday–now I need to run to the store and grab more for these perfect treats! Such a great dessert for the holidays or anytime! Those blueberries look so sweet and luscious. I love that the filling is no bake too – it’s too dang hot for the oven! Parfaits are so pretty and fun! And that cheesecake layer sounds delicious. Wow this is such a festive dessert, fireworks come to mind when I see your gorgeous dessert. I’m definitely saving for later. Perfect dessert for summer berry season! 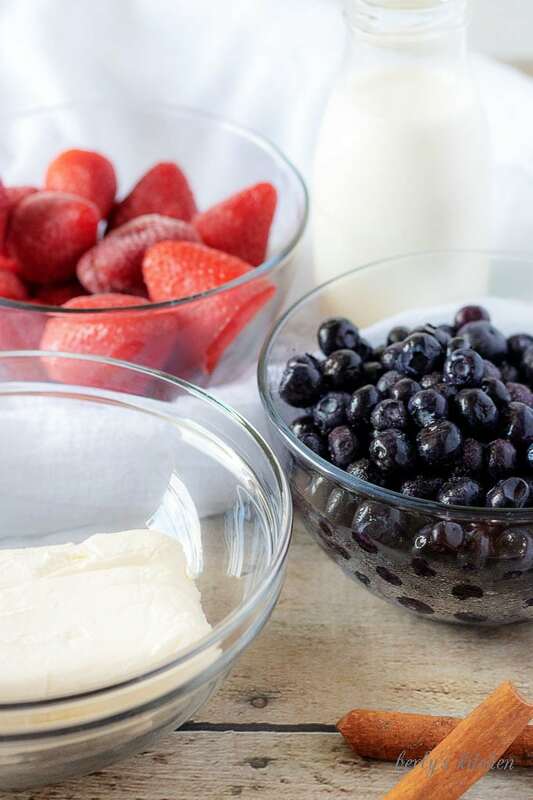 Fresh berries plus the smooth cream cheese all in one delicious single-serve option! These would be great for labor day. I know it is a while off, but I am planning a BBQ and these would be a great addition to the party! Pinning the recipe for later! Oh wow. This looks fantastic. Such a great summer treat. Super easy to make and so delicious. I can’t wait to make this.